The science surrounding cannabis is being researched more than ever, and some new findings may be surprising to the world of cannabis. With the legalization of marijuana across many different states in the U.S., it seems like now more than ever, cannabis has a chance at reaching its full potential. 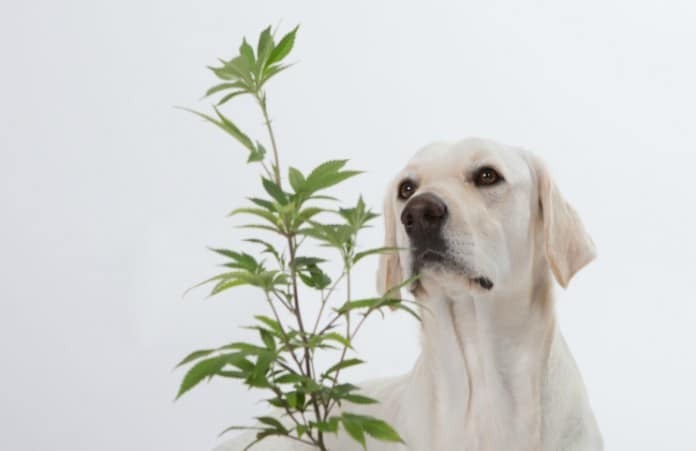 One of the many things that researchers have been exploring continues to be the idea of using cannabis and specifically CBD for pets with different ailments. The market surrounding pets is around $30 billion in value which means that there is a large amount of room to not only grow, but cannabis could potentially become a large part of the industry in the near future. With eight states legalizing cannabis for recreational use thus far, it seems like this could be the time for cannabis to enter the animal industry. One of the main issues is that most doctors are not even allowed to prescribe cannabis for people, let alone let animals use it. California veterinarians in general are legally prevented from giving any recommendation to pet owners about the use of cannabis. On a federal level, all cannabis is illegal, which includes the use and sale of CBD, one of the many promising chemical compounds within cannabis. Cannabis is being tested currently as to how safe it is for pets to use, but science has been overwhelmingly surrounding humans and their use rather than animals. Dr. Gary Richter, a 20 year veteran in the veterinary world, has become an outspoken proponent of the use of cannabis for animals and the amount of potential it has to treat a wide variety of diseases. Richter has stated that the use of CBD is strictly medical and only has medicinal benefits with no psychoactive component to it. CBD is one of the most promising aspects of the marijuana plant for treating diseases, and the fact that it is non-psychoactive only contributes further to this notion. The main component responsible for giving users the “high” is THC, which can also be very beneficial in a medical sense, but researchers continue to look into the potential of CBD. Richter states further that he things cannabis should only be given to pets as a medicine, and that there are specific doses as with any drug. He continued to state that “there is an impression that cannabis is 100% safe. This is not true, especially in pets… an overdose of cannabis can lead to loss of balance, loss of appetite and sometimes collapse.” This means that doctors who prescribe the use of cannabis for pets need to be extremely careful as to the dosage and how they will handle accurate doses of the medicine. The hopes are high that this new field of research will continue to produce promising results. Only time will tell how well the field of cannabis research for animals is adopted by the greater public, but things currently look quite good for the industry.